Sam & Jo are a husband and wife team of professional wedding photographers. 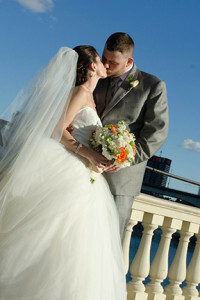 With more than 500 weddings and events on their resume’. They bring this affordable photography experience to each and every wedding they are contracted for. With their studio location in Delaware, Sam & Jo can provide wedding photography in Philadelphia, Pennsylvania and surrounding areas, South New Jersey, and Maryland without having to charge for travel. They also offer wedding engagement photography, which is a great way for couples and their photographer to get to know each other and feel comfortable. And when it comes to destination weddings such as the Caribbean, England, Europe or Mexico, special terms can always be arranged. Their style of wedding photography gives couples a unique collection of coverage on their wedding day. Their teamwork and experience is reassuring to couples, no matter what the day brings and especially when working with large bridal parties! getting to know each client personally so when they create photos together, they reveal who they truly are. Click the *contact us* link and send a note, or give them a call………can’t wait to meet you!